Used by Hospital Trusts, Ambulance Services, the Health Protection Agency and the Department of Health for on-call and emergency response. In the UK, Hospital Trusts and Ambulance Services use the ELB© for on call and emergency response. The Health Protection Agency and a number of major hospitals also equip their managerial and on call staff with the system as does the Environment Agency and some local authorities. The Department of Health also use this book as part of their response. The ELB can be used for a duty, role or for an incident. If for a duty, the book can be a record for one individual, lasting for days or weeks, depending on the amount of information received and action taken. It will be a personal record, similar to a police officer’s pocket note book. If for a role, the ELB will be a record of several, even many, individuals who might carry out the role over a period of time. If for an incident, the ELB will be a record for an incident manager during the period of an incident. Several managers might use the same log book during the incident, particularly if the incident lasts over a period of time. Duty Directors of SHA /PCT or trusts should use the ELB as a record of their period of duty, handing the book over to the next Duty Director when their period of duty finishes. Ambulance service duty managers and duty managers from other emergency services would find the ELB essential as a record for the oncoming duty manager of what had information has been received and actions taken during the previous duty time. An Incident Control Team Manager from an organisation should ensure that each incident team member has their own ELB. In organisations like hospital trusts, action card holders would fill in their individual log books during an incident. 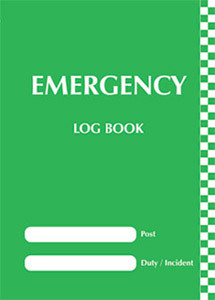 All log books used during an incident would, together, form the organisational record of the incident. The entry number (sequentially from 1 – n) can be used to mark any other document which relates to that entry, emails, phone messages or other documents. This enables a subsequent analysis to be accurately carried out. It will also enable an Audit Trail of managerial action and decisions to be carried out. If the ELB used for a role or incident is used up, the sequel book should start with the n+1 entry number. The number of the sequel book should be entered on the last page of the ELB. All entries should be initialed to ensure an accurate and complete record. The book can be filled in by a “logger” or administrative assistant, but the role holder or incident manager must initial each entry to signify that it accurately reflects the information received and action taken. If it is a duty book, the individual would obviously make and initial their own entries.